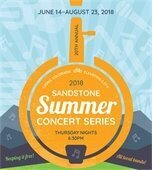 The 2018 Sandstone Summer Concert Series kicks off Thursdays, from June 14 through August 23 (except July 12), at the Raul Vasquez Community Stage in Sandstone Park. Thanks to the generous financial support of the Town and the Lyons Community Foundation, concerts are free of cost! So pack up the family and blankets, and plan to spend your Summer Thursdays at Sandstone Park! Don't miss the July 19 show, Erik Yates Band! Calling all artists! Be a part of the 2018 Lyons' Town Hall Art Shows, themed "Four Seasons"! Art of all mediums are invited to be displayed in the Shirley F. Johnson Council Chambers for a quarter. Reservations are not required. To participate, bring artwork, in accordance with the quarter theme, to Lyons Town Hall on the Friday before the show opening (schedule below), and join the Lyons Arts and Humanities Commission, along with fellow artists, for the opening reception on the following Saturday. Please prepare placards for each piece that include the artist's name, title, medium, size, price (or note if the piece is not for sale), and contact information. Deliver Summer-y hangable creations & placards on Friday, July 20, between 4 and 7 p.m. at Lyons Town Hall. 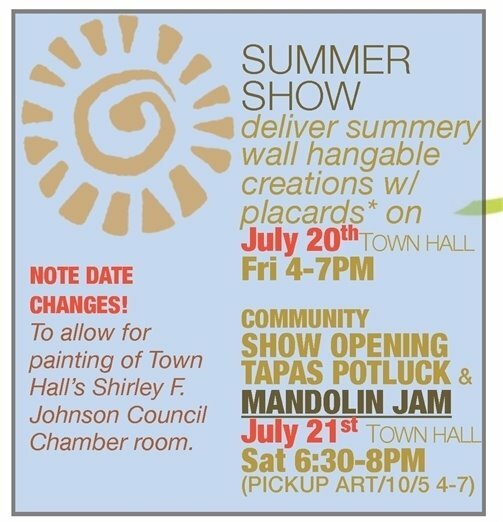 Opening Reception: Saturday, July 21, 6:30 to 8 p.m. Community show opening tapas potluck & Mandolin Jam Circle in the Courtyard at Town Hall! Displayed from July 21 through October 5. Water Conservation - it's a hot topic! Due to the extended dry period we are experiencing, water usage will increase for many residents and businesses. These water conservation tactics can help conserve water and save money on utility bills, especially during the summer months. Last year the state of Colorado passed legislation that legalized the use of Rain Barrels for personal use. Capturing and using rainwater to help meet your irrigation needs will reduce your use of potable water, saving you money and reducing your environmental impact. You can purchase Rain Barrels from most hardware stores. Moreover, you can decorate them to a channel your artistic skills (see image below).Water Conservation, it’s a hot topic! Due to the extended dry period we are experiencing water usage will increase for many residents and businesses. These water conservation tactics can help you conserve water and save money on utility bills, especially during the summer months. Last year, the State of Colorado passed legislation that legalized the use of Rain Barrels for personal use. Capturing and using rainwater to help meet your irrigation needs will reduce your use of potable water, saving you money and reducing your environmental impact. You can purchase Rain Barrels from most hardware stores. Moreover, you can decorate them to a channel your artistic skills (see image below). 1. WATER TWICE A WEEK. MAKE TURF DROUGHT-TOLERANT. Water deeply twice each week to make grass roots grow deeper and go longer without water. For sprinkler systems, cycle run times to prevent run-off. Instead of setting a zone to run for fifteen minutes, change it to water for five minutes once an hour for three hours. 2. DON’T WATER BETWEEN 10 A.M. AND 6 P.M.
3. IF IT RAINS, WATER LESS. Watch the weather and adjust watering days and times accordingly. If you have a control clock, use rain sensors to shut-off irrigation during rain events. 4. WATCH FOR IRRIGATION LEAKS. Watch for broken sprinkler heads or damaged irrigation lines that water waste. Repair leaks quickly. 5. LET GRASS GROW LONGER BEFORE YOU CUT IT. Raise your lawn mower blade and protect your lawn from heat by letting grass grow longer. 6. WATER PLANTS AND TREES, NOT SIDEWALKS. Don’t spray down your driveway with water- use a broom. Broken sprinkler heads getting your sidewalk wet? Make sprinkler repairs and adjustments to keep water on your plants, turf and trees. 7. INSTALL LOW-WATER LANDSCAPE AND IRRIGATION. Avoid installing landscaping during the hottest months, especially in dry years. When appropriate, install drought-resistant turf, trees and xeric plants. Where possible, use low-water drip irrigation. Due to construction for library, the Town and associated partners have begun preparation for relocating the recycling center (4th Ave. and Railroad) to the south side of the Waste Water Treatment Plant (WWTP) center (198 2nd Ave.). Construction for the new ADA-accessible facility is well underway; the Town estimates the move to be complete by the week of July 23. *$3.00 entrance fee is waived, but other recycling fees may apply to specific items—see our online price chart for more information. Come see what happens to your recycling after it’s hauled away. Watch the whizzing conveyor belts, the whirling machines, and the skilled sorters who ensure thatover 45,000 tons of recycling gets processed each year and made into something new! This is a family-friendly tour, so bring the whole team! 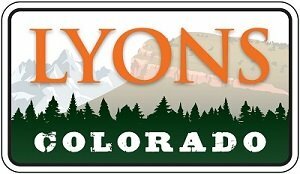 We’re gathering residents who want to help shape the future of Lyons at Pizza Bar 66. Join us for pizza, and weigh in on how we can work together to make Lyons a Zero Waste leader! Come armed with your recycling questions or just sit in to hear the latest news about Zero Waste in Lyons.